A vegan charity plans to place an anti-dairy billboard at the site of major truck accident in California. Almost 30 cows were killed in the accident, which took place near the intersection of Highway 43 and Pond Road in Bakersfield, when the truck carrying them became stuck on railroad tracks was hit by a train. 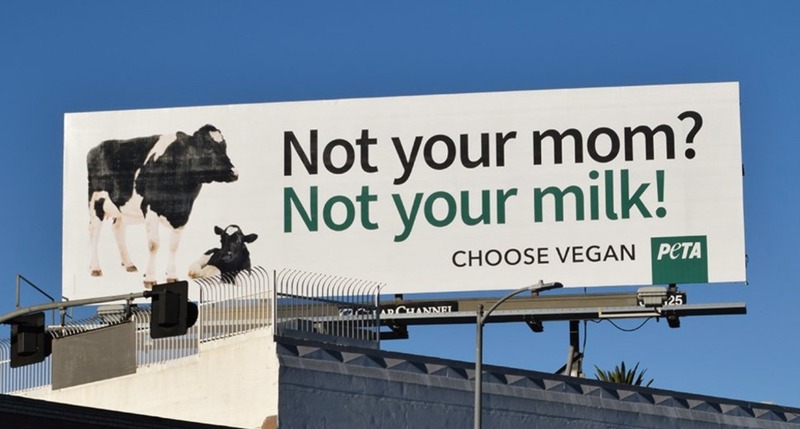 The billboard will show a cow and her calf next to the words: "Not Your Mom? Not Your Milk! Choose Vegan." "The terror and pain that these trapped cows likely felt as a train barreled into them are hard to imagine," PETA Executive Vice President, Tracy Reiman, said in a statement. "PETA hopes to pay them tribute with a billboard reminding people that the best way to prevent mother cows from suffering in the dairy industry is to go vegan." The charity adds: "In today's dairy industry, cows are kept almost constantly pregnant in order to maximize milk production. Calves are taken away from them within hours or days of birth so that their mothers’ milk can be consumed by humans instead. "Male calves are typically shipped off to be slaughtered for the veal industry, while female calves endure the same fate as their mothers: repeated forced insemination with a 'pregnancy gun' until their milk production wanes, at which point they're sent to the slaughterhouse."